Learn more about a program that allows public access to private lands. Clint started the Walk-In Access pilot program in the Northern Region in 2005, and has helped run it ever since. He enjoys the opportunity to open new areas for the public to hunt, trap and fish on. THE WALK-IN ACCESS (WIA) PROGRAM provides the public access to hunt, trap or fish on privately owned land, streams, rivers, ponds or reservoirs. The Division of Wildlife Resources (DWR) provides monetary compensation, liability protection and discretionary law enforcement to landowners who enroll their properties in the program. 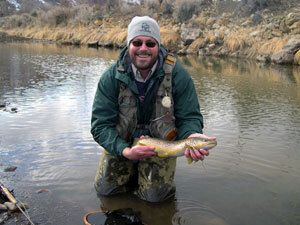 A happy angler caught a 20-inch brown trout on a Walk-In Access portion of the Weber River. Payment for each property is based on the length of time the property is enrolled, the size of the property and the activities allowed. The landowner and WIA manager then agree to the best location for parking and registration, as well as any specific rules that apply to the property. Starting this fall, hunters and anglers must obtain a Walk-In Access Authorization (WIAA) permit in order to use WIA properties. WIAA permits are free of charge and are currently available through our online license system. WIAA permits may also be obtained by calling 1-800-221-0659. If you call the phone line, you will be given a number over the phone, and then your WIAA permit will be mailed out. All WIAAs are valid for the calendar year and will expire on December 31. 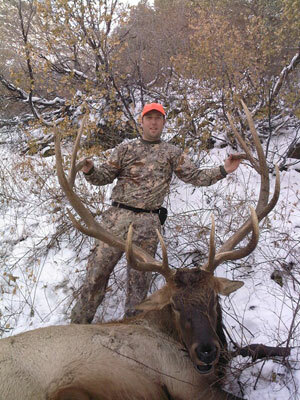 This bull elk was killed on Walk-In Access property in Cache county. Finding WIA properties on the DWR’s website is easy. You can search by properties closest to you, or in a unit where you may have a special hunting permit. There are maps, standard rules and harvest-allowed species lists for each property. This part of the website is also where you’ll find special rules, such as the requirement to contact a landowner before accessing the property. To access most WIA properties, you simply park in the designated area, go to the registration box and sign in. Then you’re allowed to hunt, fish or trap in that area. After you’re finished, you sign out. More than 90 percent of all WIA properties are this easy to access. Each region provides different types of properties. Some offer big game hunting and upland game hunting, while others offer waterfowl hunting, trapping or fishing on rivers, streams or ponds. The DWR is always eager to enroll new landowners and properties in the program. If you haven’t ever visited a WIA property, this is the year to do it. Just remember to obtain your WIAA permit, respect private property and follow the rules of the area. Do you have to have a walk in authorization number if you are only hiking? I tried to get the authorization number, however it said it had to have a hunting or fishing license. Diane, I am not an authority on the subject but the WIA program is specifically for sportsmen and not for casual users. The money used to fund the WIA program comes from the sales of permits so it is fair to limit the usage of the areas to those who have purchased a permit.